This is the page where you can read more about our group, our beliefs, our focus & vision. Our group is a newly formed one, although we have all been circling together for quite some time. We share a strong spiritual bond, and consider ourselves family. We are a group of like-minded individuals who still maintain a eclectic solitary practice as well as practicing together in the group setting. We lean mainly toward a Celtic path, but we do work with many different Deities from various Pantheons. We strive to learn as much as we can about different paths, and the path we are on. We work together to make Sacred Earth a sanctuary in which to meet, circle, laugh, learn & study. We meet for the New & Full Moons as well as on each of the Sabbats. New Moons & Sabbats are always open & children are welcome to participate in circle or just come for the food! As stated before, we consider ourselves family & that includes yours!Full Moons are closed to all but Full members so that we may do more serious magick & really tap into the group energies. Esbats are usually held on the Saturday closet to the actual date, while Sabbats are usually held the day of. Our group is comprised of 3 full members who are each equally important to the group dynamic. There is no High Priest or High Priestess, we are all Priests & Priestesses of our craft. We design rituals & other magickal workings together as a group. We may each call a Quarter, or we may all call them in unison, inviting the Elements into our circle. All major decisions in our group are done by consensus. Full members vote, and we make the decision together. When creating & doing spellwork, all full members are involved--every step of the way. 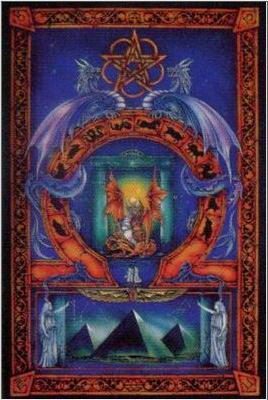 From choosing catalysts such as herbs or stones, to writing words of power, & doing divination on the focus of our working, it is truly a team effort. We are open to new members, after an introductory period. We feel that it is important for you to get to know us, as well as us getting to know you, before making your intentions known to the group. If after this introductory, or "seeker" period, you wish to become a full member of Sacred Earth, we will ask you to make your intentions known to all group members, and we will vote. Choosing to become part of a working coven is a very big step, and not one to be taken lightly. That is why the "getting to know you" stage is very important. While we hope that you will find us & our group to be just what you're looking for, that is a decision that only you can ultimately make for yourself. We do ask that you are at least 18 years old, have dedicated yourself to the path and know where you are heading. As of right now we are not primarily a "teaching coven", as we are all learning continuously. That is not to say that we will not help you if we can, and all learn together, just that we do not have any type of "formal" training available at this time.